Piece together the perfect workforce management solution. TruTime® automates the collection, calculation and preparation of data for payroll, provides you with powerful tools to analyze your labor and payroll costs, and streamlines your workforce time and attendance procedures, increasing the efficiency of your operation. The most costly resource of any business is its workforce. 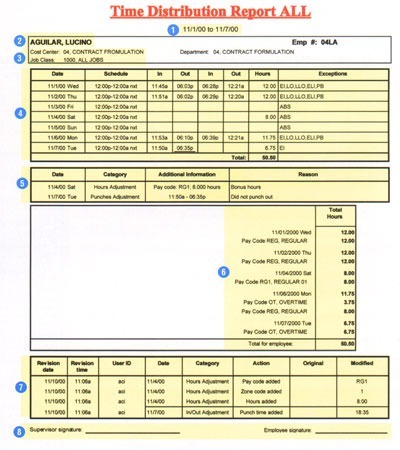 Fast, reliable and accurate data capture and processing of its time and attendance information can save labor and production dollars – a direct contribution to the bottom line. Labor is the lifeblood of your organization – on-premises or off-premises. The more labor information you have, the more efficient and profitable your business will be. TruTimea allows you to capture that important data regardless of your employees location. 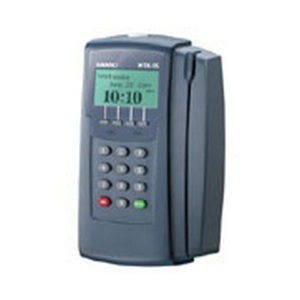 The MTX data collection system is powerful enough to meet your needs today. . . flexible enough to grow with those needs tomorrow. 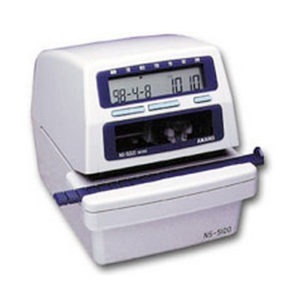 Modular design lets you start with the MTX-10 for simple IN and OUT punching and easily upgrade to new technologies in the future. 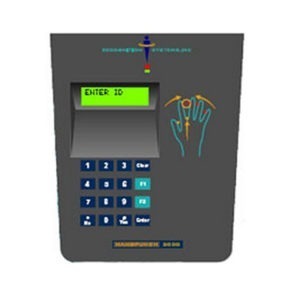 The MTX-20 accepts employee validation tables, displays messages and names, and offers interactive functionality including customizable keypad and display using MTX-PRO. It’s your choice, based on your needs. Lost badges? Forgotten punches? Buddy punching? Who would have thought the answer to so many common time and attendance problems would be quite literally "at your fingertips?" 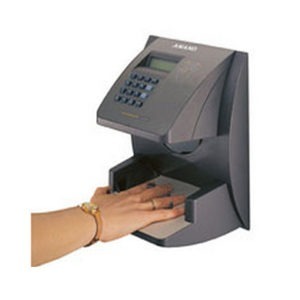 The Handpunch virtually eliminates errors in time recording by using biometric measurements of the hand to recognize employees. Extend the power of your time solution across town. . . or across the world. Employees can collect information about their hours and punch times, check benefit time, or simply punch in and out, all from a standard web browser. Today’s workforce isn’t always the nine-to-five office crew of the past. In fact, many employees rarely come into the office at all. With CellPunch, these employees can use their existing web-enabled wireless phones as interactive time terminals. A mobile workforce needs a mobile time solution. Mobilepunch turns any common PDA device into that solution. 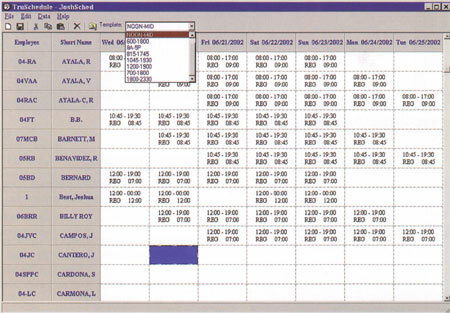 Especially useful in work groups or teams, this software allows employees to punch in and out or perform labor transfers, while giving supervisors the ability to add hours or specific punches while in the field. How you operate and how you perform separates you from your competition. 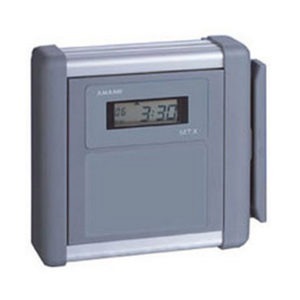 How you configure your time and attendance system may be a reflection of those differences, as well. 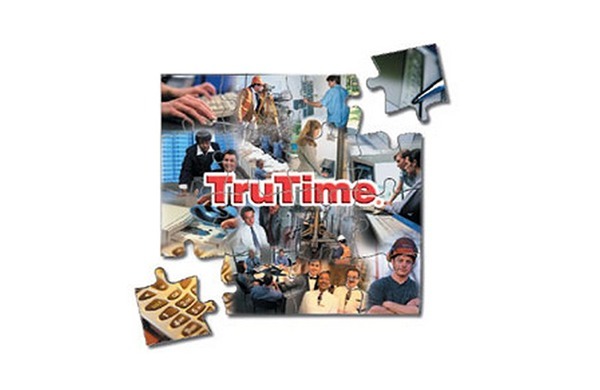 TruTime® is designed with the flexibility to deliver the system you want from unique pay codes to multiple day time changes, special overtime or holiday pay. The choices are yours to make regardless of complexity. TruTime® maintains a comprehensive data file for each employee including HR data, schedules, benefit time, personal messages and wage and pay information. User-friendly and intuitive. Simple menus ensure logical navigation while window desigm are straightforward.. . I free of clutter. You have the ability to customize menus and applications to suit your individual needs. ..arm & and title menus to meet those needs.. .streamline menus to inctwde only those tasks you use.. .or even launch your payroll software from within those menus. TruTime also allows user-definable fields that you can create to store custom information about employees.. . information you can later use to filter reports. 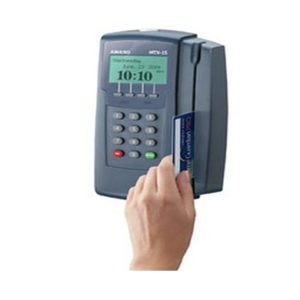 When dealing with sensitive time and payroll data, security is at a premium. 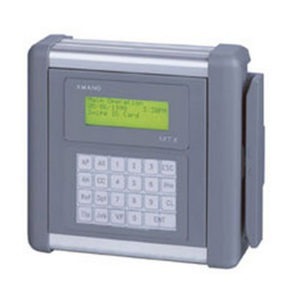 TruTime uses a secure log in system with custom user ID’S and access levels. The system administrator may give users access to specific departments or employees and restrict modules each may access.. .your choice. 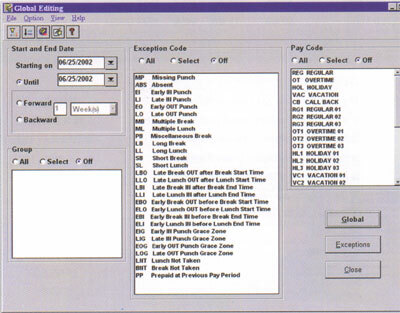 Try adding your everyday software applications to TruTime® – create your own custom menu! 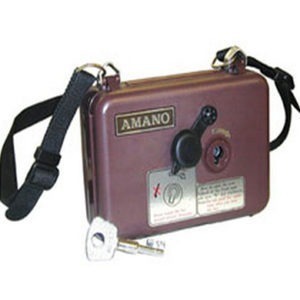 Only Amano offers TruSchedule®.. . the application allowing users to view select employees for specific date ranges, including the ability to select them. Choose from existing schedule templates or double click individual squares to enter a new schedule. Even vacation or time off scheduling is easy.. .and, since the application is customizable, individual managers can save preferred settings in a template for easy access later. Using Advance Schedule is easy to do. Enter the appropriate schedule dates and hours – days, weeks, even months ahead of time. Even if the employee’s schedule changes, TruTime can be set to discern between time worked and vacation time, applying only the appropriate hours. 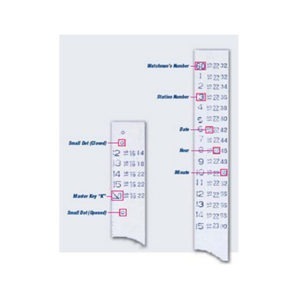 Cut and paste schedules to save time – schedule your entire department in minutes! 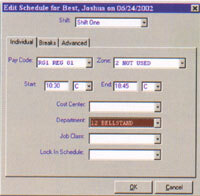 The Auto Schedule applies employees to one of a group of schedules based on their IN punch. 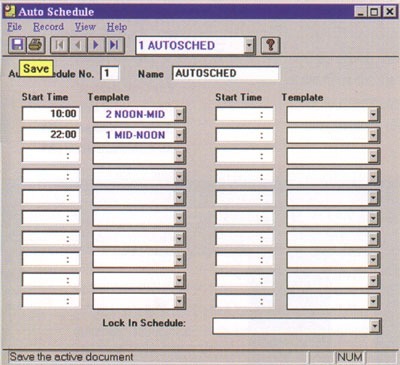 Schedules that change frequently pose no problem… Auto Schedule is smart enough to recognize the differences so no changes to the software are required. TruTime users spend much of their time utilizing Edit Daily Data. 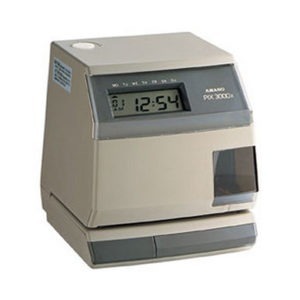 The simple interface guides users through total hours and punch exceptions. Punches collected from a data terminal are shown in black, while edits appear in bright red. Users can break down or code hours to different departments or job classes, enter tips, or add reasons for changes. 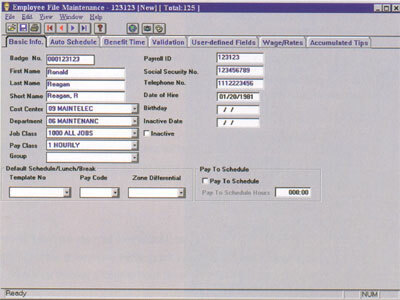 Optional Hours Authorization ensures all totals have been verified and electronically signed for delivery to payroll. 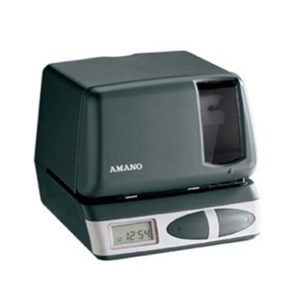 Hours Adjustment: Easy addition or sublnrction of bulk hours. Add holiday and vacation time, or make adjustments to total hours. 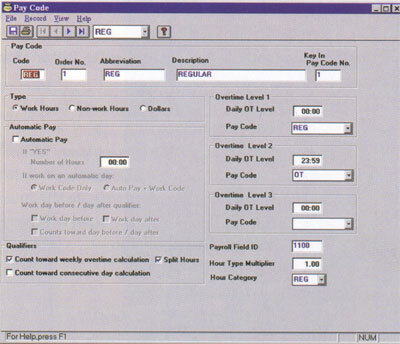 Accumulated Hours: A snapshot of the employee’s hours accumulated during current pay period – this screen paints a compete historical pictue of activity at the click of a button. 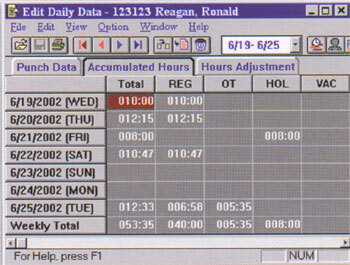 Global Edit Daily Data: Quickly assign a punch time or bulk hours to a large group of employees. For example, rather than making ten different edits for a day’s sick employees, this screen lets you credit all the employees with sick time with only one edit. The global interface also combines exception reporting with editing to produce an incredibly simple tool that saves you time and money. The power of time and attendance automation is two-fold – moving to automated calculations and data transfer is but part of the equation. 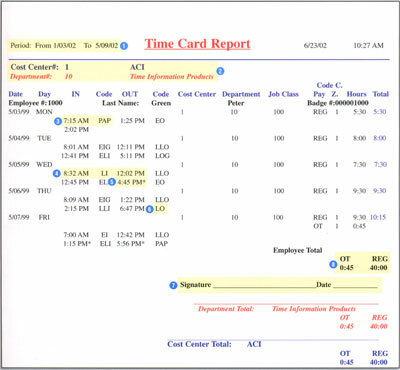 TruTime’s powerful Management Reports Suite also puts information at your fingertips instantly. 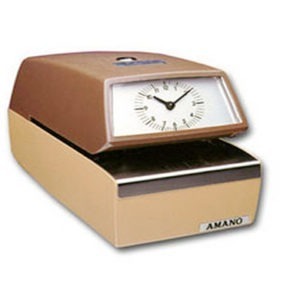 Traditional time sheet or time card systems cannot provide such detailed data. These reports – assist users with punch and hours corrections, show employee attendance trends and habits, help better manage overtime, show hours allocated to departments or jobs – even reports who is on-premise. Realize the full potential of automation with these 22 all-inclusive reports. 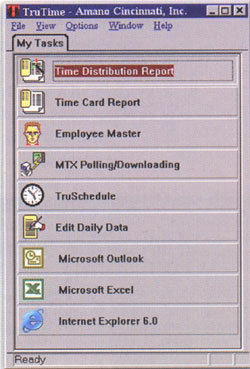 All reports are part of the standard TruTime package. All reports may include any date or date range specified I by the user as well as any employee or employee range. All reports may be sorted according to the user’s needs. All reports may include hours, dollars, or both hours and dollars information, provided TruTime is being used to track wages and rates. All reports may be viewed in many common applications such as Microsoft Word or Excel. 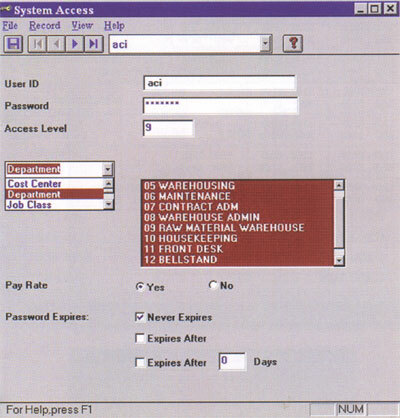 Reports can be set to run automatically to the printer or to a file at specified times throughout the week. The Distribution Time Report uses a simple software wizard to develop unlimited custom reports utilizing any of the data in the TruTime system. Users tweak settings to create templates to suit individual requirements. 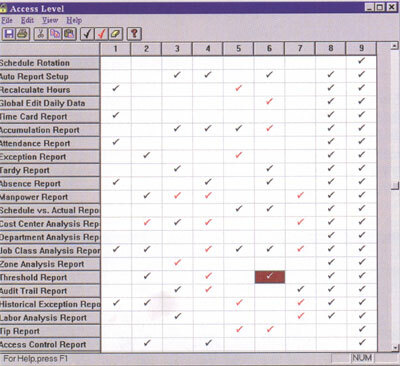 The Exception Report shows punch irregularities or erros and is perfect for distribution to department management for corrections. 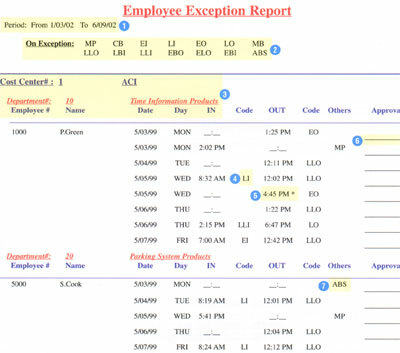 Only TruTime offers such detailed exception reporting, including 30 different exceptions. 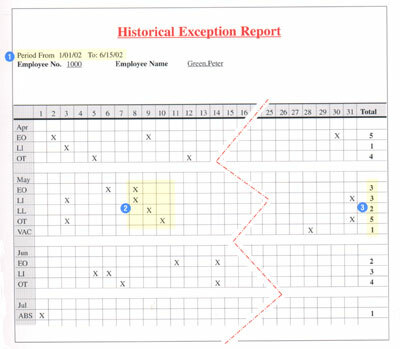 The Historical Exception Report shows punch irregularity trends over a user-defined period of time- perfect for employee reviews or policy development.